The Florida Library Association honors outstanding libraries, individuals, businesses, and library supporters during its annual conference. 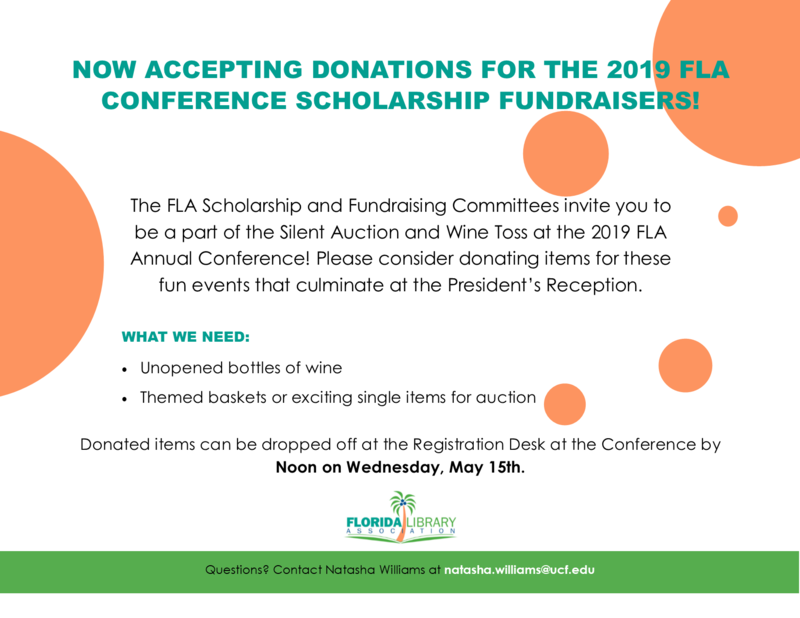 Nominations may be submitted by any member of the Florida Library Association. Both the nominator and the nominee must be members of FLA (unless otherwise noted in the award description). Each Award has a rubric providing information to nominees on exactly what the committee is looking for when deciding on a winner. Nominees are also encouraged to provide supporting documentation with their award nominations; documentation can include letters of support, newspaper articles, flyers, etc. of the Year To recognize a member of the Florida Library Association for distinguished service to the Association. To recognize outstanding and ongoing contributions to Florida librarianship. the Year To recognize a Florida library that has demonstrated outstanding service to its community. Lifetime Achievement To recognize a librarian with a long-standing, distinguished record of professional achievements and accomplishments. New Librarian To recognize a Florida librarian who is new to the profession, has made significant contributions to their library and librarianship, and demonstrates potential for professional development. Outstanding Paraprofessional To recognize a library paraprofessional or support staff member who has made a significant contribution to libraries in Florida. Intellectual Freedom To recognize an individual or organization that has made a significant contribution to increasing the right of access to the intellectual content of both print and non-print media. Library Innovation To recognize a Florida library that has displayed innovative methods, projects, products, or organizational enhancements, such as using current and emerging technologies for library processes or information service delivery. Maria Chavez- Hernandez “Libraries Change Peoples’ Lives” Dr. Chavez-Hernandez received her PhD in Library Science and Information Studies from Florida State University in 1991. She was responsible for a large body of work focusing on Library and Information Services in the Caribbean region, and provided many resources and programming on the specific library and information needs of Latin American immigrants and their families. Dr. Chavez-Hernandez was also an active member of FLA, ALA, the Association of Library and Information Science Education (ALISE), the National Education Association (NEA), and REFORMA (National Association to Promote Library Services to Latinos and the Spanish Speaking). Dr. Chavez-Hernandez passed away in 2008. The Florida Library Association created this award to honor the memory of Dr. Chavez-Hernandez and to perpetuate the dynamic spirit of her work in expanding the opportunities of information access to under-served and immigrant populations. Betty Davis Miller Youth Services Awards To recognize outstanding programs of direct service to youth. Two awards will be presented annually: one for children's services (ages 12 and under) and one for teen/young adult services (ages 13 - 18). Excellence in Marketing and Public Relations To recognize outstanding strategic marketing or public relations projects or campaigns that show results. Exemplary Instructional Programs or Services To recognize a Florida librarian or team of librarians and staff members who design, plan, execute or evaluate a continuing program or special project of library instruction. Further, the purpose of this award is to recognize best practices of sound design and the implementation of products and services in order to enhance learning in libraries. Continuing programs or special projects may include classes written and taught by library staff, structured tutorial programs coordinated by libraries, online tutorials or programs, or paper-based fact finders. Libraries Mean Business To recognize a library's contributions to the business community. Library Web Presence To promote awareness of the importance of good design and usability in web page development and to recognize outstanding examples of effective library web pages and a library's overall web presence, which may include blogs and other social media. This award will be presented to one Florida library that provides excellent service via the World Wide Web. This award recognizes exceptional research in librarianship, library science, and research into problems, challenges, and/or issues in libraries published by a Florida librarian or library staff member during the past two years. Research projects may include published books, book chapters, journal articles, white papers, bibliographies, or other significant contributions to library literature. Blog posts, master’s theses, and doctoral dissertations are not eligible. Submissions will be judged based on their contributions to the field of librarianship. Friends, Foundations, and Boards Outstanding Member To recognize a member of a Friends of the Library group, a library board member or a library foundation member for outstanding service or achievement. Outstanding Business or Media Partner Award To honor a company, business partner, or media agency (including newspaper, television, magazine, etc.) for their leadership or significant contribution in support of library service to a local, regional, or state-wide library organization. Outstanding Citizen Award To recognize the distinguished activities of a citizen of Florida in advancing the stature of libraries within the State of Florida.